Studies conducted throughout the world have been pointing out to the brain’s reactions to speaking two languages. The benefits of speaking two languages go from focus to dementia prevention. A recent study has brought up a topic that has already been largely debated and investigated by researchers: what kind of benefits does the ability to speak two languages bring to the brain? Researchers and professors in the health area, and even psychologists, are responsible for carrying out these studies and bringing them to the society. 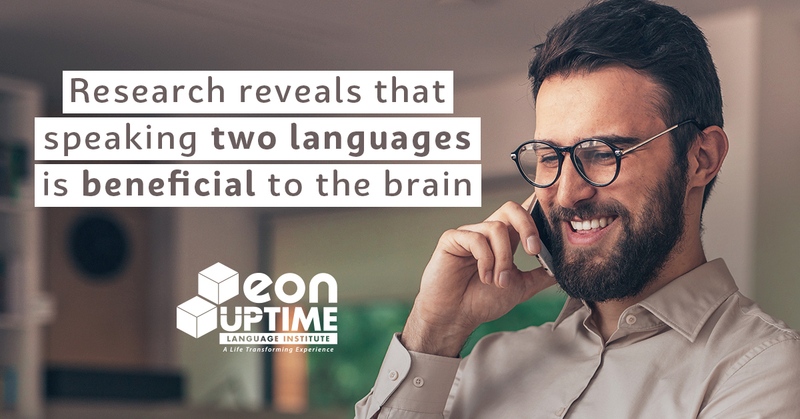 In this post we will present this research, their methodology and results that prove the efficiency of a bilingual brain. Simple reasoning is related to prevention of Alzheimer’s disease, according to results recently published. The study was carried out by Ana Inés Ansaldo in 2016, at the Research Center in the Montréal Geriatrics University Institute, in Canada. In her research, a bilingual and a monolingual group of elders were submitted to a test: they had to focus on an object’s visual information, while ignoring other types of information, like spatial. The results showed that there was no difference between the groups, but subjects’ brains acted in different ways. While the bilingual group’s members answered the questions in a simpler way, the monolingual group’s members had to activate more complex brain areas. Another study came from the Northwestern University (USA), published on the scientific journal Proceedings of the National Academy of Sciences (PNAS) in 2012. 48 students, 23 being bilingual, were volunteers to listen to different sounds while they were monitored. For that, electrodes were placed on their scalps, in order to map the pattern of their brain waves. Regarding silence, both groups reacted similarly. The difference appeared in a noisy context: the ones who could speak two languages stood out in the sound processing. The bilingual group was more capable of tuning in important information such as the speaker’s voice and ignoring the other distracting noises, like background conversations, for example. This difference was clear in the brainstem reactions of the two groups. According to the professor Nina Kraus, who coordinated the research, “the bilingual people’s experience is enhanced, with consistent results”. This way, still according to Kraus, the bilinguals’ auditory system is “highly efficient, flexible and focused on automatic sound processing, especially in complex listening conditions”. “It seems like the benefits of bilingualism are especially wide and powerful, and include increased focus and sound selection and coding”, added Vironica Marian, researcher and co-writer of the study, to BBC. This advantage was discovered in 2003, by Ellen Bialystok, a researcher at York University, in Toronto Canada, published by the magazine Galileu(LINK). The real difference appeared in analysis of nonsensical sentences, such as “apples grow in noses”. While the children who could only speak one language got confused by this ridiculous idea, the bilingual children gave the right answer – there are no grammar mistakes in that sentence. Bialystok proposes, then, that bilingual people’s brains pass through improvements in the ‘executive system’: a set of mental skills that makes is possible for us to block out irrelevant information. This advantage is responsible for the bilingual person’s ability to focus on the grammar and ignore the meaning of the words. Improvements in this system, therefore, enable a higher mental flexibility. Paula Rubio-Fernández and Sam Glucksberg, both psychologists at Princeton University (USA) have found out that bilingual people are more capable of putting themselves in other people’s shoes, since they are more able to block out information they already know and focus on the point of view of others. Now that you know a few benefits of speaking two languages, start studying in a course with an innovative methodology.